As he’s done countless times before against top quality arms, Colton Welker again delivered in Chicago at the 2015 Under Armour All-America Game — this time it was for a sharp single up the middle off a 91 mph fastball. In addition to his instinctual ability to deliver the barrel to the ball, he is a versatile and capable infield defender — in this game he first entered at 2B and later moved across to 3B. He didn’t play there for us, but he is more than capable of holding down SS if called upon — in fact, you’ll see him there in the video clip below from the College PREP Program workout in April 2015. 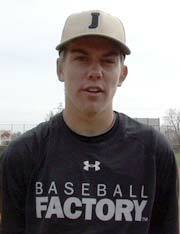 We first saw Colton in September 2012 at the Under Armour Fall Classic as a member of the Black Panthers Elite. We had a lot of rain at that event, limiting our scouting coverage since we didn’t see much baseball. 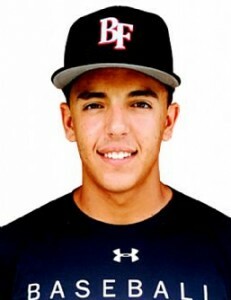 In January 2013, he attended the Under Armour Baseball Factory National Tryout in Delray Beach, FL. At that event, just prior to the start of his freshman season, he showed advanced ability to find the barrel in BP — a sign of things to come for the future. His move was noted as unique even then, but his hand-eye coordination and ability to deliver the barrel to contact was already evident as well. He reached 86 mph raw velocity, and ran 7.51 in the 60 yard dash. 5/25 – Power to pull side, aggressive hitter. Good strike zone knowledge. Athletic build, projectable. 2016 SS Colton Welker (Stoneman Douglas HS – Coral Springs, FL – Univ. of Miami commit) showed defensive ability on par with Michael Amditis’ catch & throw skills and Nick Derr’s speed. His actions were easy and fluid, and he showed the ability to finish a variety of plays with strong throws across the infield. Like Nick Derr, he touched 92 mph raw velocity — ranking him very near the top of all 2016 graduates we’ve seen in that category. He came in just under seven seconds in the 60 yard dash at 6.99, and reached 88 mph bat exit velocity. His glove is easily ahead of his bat (which perhaps could be true in a workout, but turned out to be totally wrong based on his summer 2015 game performance — see below), he has rhythm to hit and makes a coordinated move through the zone — more than enough to merit a close follow to see how his bat develops. As the summer of 2015 went on, it became more and more clear that Colton can consistently square up top quality pitching. Despite a somewhat unique move, he has more live game hard contact under his belt than just about anyone else in the 2016 class — making it impossible for us to pass on him for the 2015 Under Armour All-America Game.